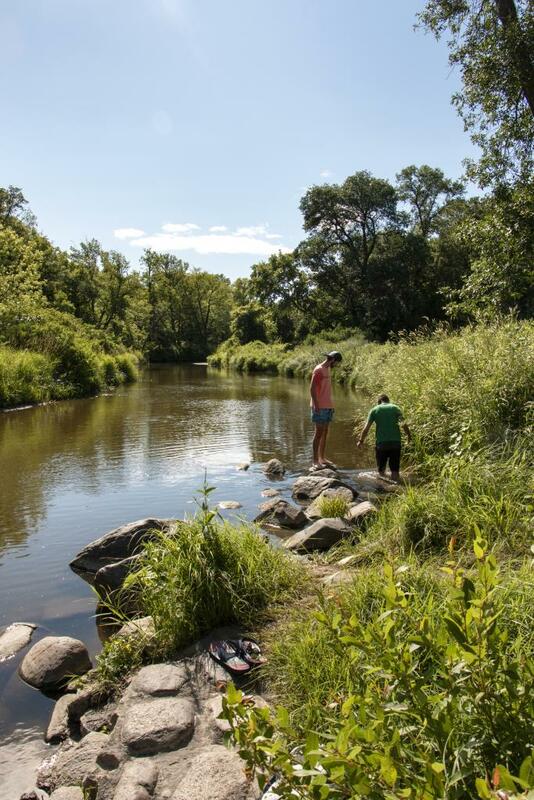 Constructed in the 1930s by the Civilian Conservation Corps, Turtle River State Park is located in a beautiful, wooded valley along the meandering Turtle River. The park features year-round recreational activities, including camping, picnicking, hiking, mountain biking, cross-country skiing and sledding. Park guests enjoy shaded picnic areas and secluded camping sites. There are over 10 miles of trails carved through the forested hills and along the Turtle River. Anglers can also practice their fly fishing techniques in the trout-stocked river. Perfect for weddings, family reunions and other group activities is the spacious Woodland Lodge, with its kitchen and dining hall. The upstairs of the Chalet/Warming House is also available to rent for just about any type of group function. The CCC Memorial Shelter offers a picturesque setting and is popular for wedding and large group picnics. 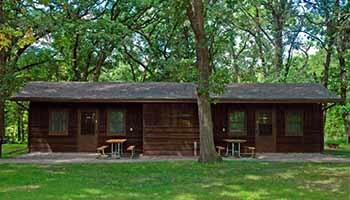 Turtle River State Park's Woodland Cabins are a good option for larger groups. The cabins are duplexes with a total of 12 units. Ten units sleep six each, bunkbed-style, while the other two units are wheelchair accessible and sleep three each. All units are equipped with private showers and toilets. - Cabin users are expected to do general cleaning before vacating, including sweeping, wiping down surfaces and collecting and bagging trash. - Smoking is not allowed in any cabins. - Game or fish cleaning in or around cabins is not allowed, please contact park staff for other arrangements. - Pets are not allowed in cabins. This meeting room seats 30 in classroom style or 50 audience style without tables. Full audio-visual systems, screen/whiteboard, and WiFi are provided. It is available year round and can be booked by calling the park at (701) 795-3180. The Woodland Lodge dining area seats up to 100. The facility has a fireplace and a full-service kitchen. Gas grill available for an additional $50/day fee. A two-day minimum rental required May 1-October 31 on weekends. It is available year round and can be booked by calling the park at (701) 795-3180. Chalet meeting room seats 40 and is available year-round. The rental includes a fireplace, tables chairs and catering kitchen with microwave and refrigerator. No stove, dishes, or cookware provided. It is available year round and can be booked by calling the park at (701) 795-3180. Two reservable shelters are available. The Agassiz shelter holds 40-50 people and the CCC Memorial Shelter holds groups up to 300. Picnic shelters can be booked by calling the park at (701) 795-3180. Turtle River State Park has a system of mountain biking, hiking, and interpretive trails. Winter users will find more than 7.5 miles of groomed cross-country ski trails, and plenty of opportunities for snowshoeing. This wooded trail is accessed from the CCC Trail Head and returns to the same location. This trail crosses over the Turtle River and winds along the river corridor. It provides access to the Riverview and Timber trails and is groomed for cross-country skiing in winter. This prairie and wooded trail is accessed from the via the Prairie Pass Trail. This trail loops through the prairie, into the wood line following the river corridor and returning to the prairie. This wooded trail is accessed from the CCC Trail Head via Fisher Loop and returns to the same location via Riverview. It begins along the Turtle River and meanders back through wooded hillsides. It is groomed along a modified route for cross-country skiing in winter. This prairie trail is accessed from the CCC Trail Head via Fisher/ Riverview and ends at the Moose Head Trail accessed via the Woodland Lodge Trail Head. This trail meanders through the prairie, crossing the old entrance roadbed and features the old entrance booth as a resting location. Coneflower, Moose Head and Riverview trails can be accessed from this trail. This scenic trail begins at the Woodland Lodge Trail Head and loops back to the Chalet and ball diamond. This trail is mostly wooded as it meanders along the creek corridor and features a foot-bridge crossing at the southeast end of the trail. Prairie Pass, Riverview, Eco Loop, and the Woodland Lodge can be accessed from this trail. This wooded trail is accessed from the CCC Trail Head via Fisher Loop and ends at the Woodland Lodge Trail Head. It begins by crossing the Turtle River and climbing the ridgeline that follows along the river with benches for viewing the river. The trail returns to the river corridor at the CCC Dam and ends at the Woodland Lodge. Prairie Pass, Moose Head and Timber trails can be accessed from this trail. This trail begins at the CCC Memorial Shelter and ends Woodland Lodge Trail Head. This trail follows the Turtle River corridor with access to the river. This scenic trail begins at the Chalet Trail Head and ends on the Moosehead Trail. This trail features wooded hillsides, open prairies and views of the oxbow wetlands. Cattail trail access via this trail. A modified route is groomed for cross-country skiing in the winter. This trail is accessed via the Eco loop trail. It features a wildlife viewing station of the oxbow wetlands, boardwalk crossing of the oxbow, and finishes in the wooded hillside of the Eco loop trail. This scenic trail begins at the CCC Trail Head and loops back to the Woodland Lodge. There are several connections to the campground, amphitheater, and the playground. This trail is mostly wooded as it meanders along the creek corridor, featuring a water crossing at the north end of the trail and two benches. Portions of this trail are groomed for Fat Tire Bikes and hiking in the winter. This scenic trail begins at the Trapper’s Rest Campground and ends at the Hollow’s Bridge parking area. There are several connections to the campground, Agassiz picnic area, and the Turtle River. This trail is wooded as it meanders along hillsides of the river corridor. Portions of this trail are groomed for Fat Tire Bikes and hiking in the winter. This scenic trail begins at the Visitor Center and ends at the Hillside Picnic Area with access to the Hollow’s Bridge parking and picnic area. This wooded trail winds through the hillsides and along the river corridor. Portions of this trail are groomed for Fat Tire Bikes and hiking, and others for cross-country skiing in the winter. A PDF Map of the summer trails is available here. 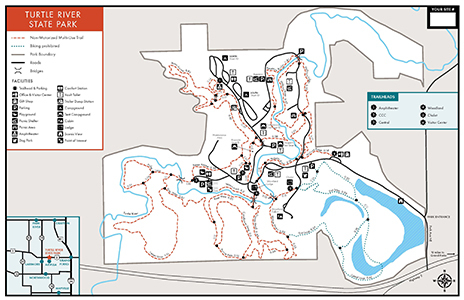 A PDF Map of the winter trails is available here. Join us for a weekend of family-friendly fun. Bring your costumes and decorations for Halloween in July.